BANGI, 6 June 2014 – The way each of the Malaysian Prime Ministers handled crisis and issues during their tenure, were largely influenced by the times and situation they were in. Journalist Datuk A. Kadir Jasin in a talk on “Managing of Crisis in New Media Environment: How Prime Ministers Handle the Crises”, looks at how well or how bad they each dealt with crises they faced and the media’s role. The talk was organised by the Institute of Malaysian and International Studies (IKMAS) of The National University of Malaysia (UKM). Kadir spoke of how every Prime Minister of Malaysia has had to deal with managing crisis during their tenure and how they handled them while keeping the media in check. The media’s role in each of the crises reflects the environment and situation of each Prime Minister’s administration. Kadir started working as a journalist when Tunku Abdul Rahman Putra was nearing the end of his tenure as Prime Minister and spoke of the different environments that the Tunku had to deal with compared to what current Prime Minister Dato’ Seri Mohd Najib had to face. “They were different times. The 1969 election saw the government nearly losing to the opposition with very close winning margins in many constituencies. Racial tension was high in the after math of the elections and then, May 13th happened. That was before the Internet,” Kadir said. Back then, the media’s reach was not as strong but were used to their full extent. Flyers, articles and posters were mass produced during the campaigns. The mainstream media of newspapers, magazines radio and television were controlled by the government thus allowing the ruling government to handle the situation better. The internet was not about yet at the time and media control was easier during the times of the Tunku, Tun Abdul Razak bin Datuk Hussein and Tun Hussein bin Dato Onn. Kadir said it was during the time of Tun Dr Mahathir bin Mohamad, that the internet was taking off especially during the fallout between Tun Mahathir and his then deputy, Datuk Seri Anwar Ibrahim. The Multimedia Super Corridor (MSC Malaysia) was established in 1996 with the aspiration of becoming a global hub for ICT and multimedia innovation, operation and services aimed at transforming Malaysia into a knowledge based economy and to achieve developed nation status by 2020. The MSC was being developed during Tun Mahathir’s time but he never got the chance to use it. 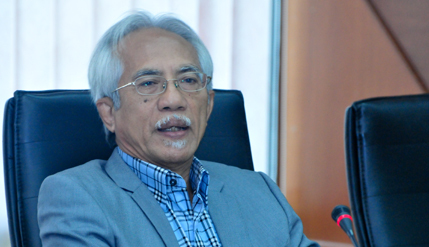 Kadir mentioned that Datuk Anwar realised the potential of the MSC and when it was launched, he used it to gain public sympathy and support during the 1998 scandal. Due to that incident, the internet in Malaysia is predominately dominated by those supporting the opposition. Government supporters are still mostly mainstream media readers who trust their printed copy more than the World Wide Web. Even in its infancy, the internet showed the strength and power it could wield over politicians, politics, the public and news and then revolutionised and even changed the rules and terms of the media game. Among all the six Prime Ministers, Kadir said the current Prime Minister, Najib will have the most difficult time during his tenure, because of the current environment he has inherited from his predecessors. The internet and technology coupled with youthful ignorance, have led to a multitude of online forums, debates, disputes and scorn targeted towards Najib and the ruling government. Any crisis that Malaysia faces, Najib would have to handle knowing that every action he takes will be magnified under a magnifying lens of a camera or camera phones and uploaded to the web via Youtube. Kadir said although the Tunku, Tun Razak and Tun Hussein had to deal with the aftermath of war, the problems of poverty, communism, riots, race and religious fights, they did so knowing they had a solid control over the media. Every step they took and any backlash that might occur could be tweaked to show the good side of a situation thus keeping part of the truth away from public eyes. Advances in technology now have made the new media both a powerful and destructive force in the terms of crisis management for any government. Although the internet had become more functional and active during Tun Mahathir’s time as Prime Minister, Kadir mentioned how it had not yet reached its full and powerful potential like it is today and this enables Mahathir to maintain control over the media. But Najib do not have such a luxury of hiding certain unpalatable information as everything is readily available at a click of the computer. Thus nothing is secret any more but everything that is found and read on the internet must be taken with a pinch of salt. The times are changing to suit the technologies that are coming out and Kadir feels that governments must adapt to such changes or risk losing their hold on society.